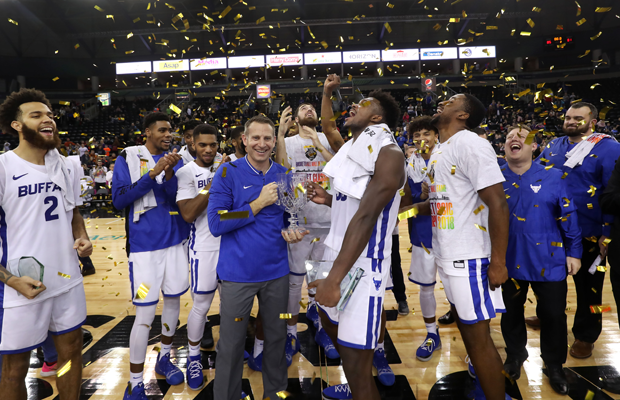 University at Buffalo held on down the stretch to take down previously undefeated University of San Francisco 85–81 and claim the the Goliath Bracket Championship title at the Basketball Hall of Fame Belfast Classic on Saturday afternoon at the SSE Arena, Belfast. 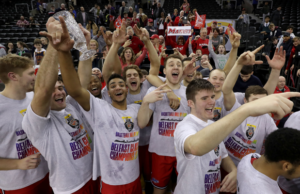 Heading into the game, both sides were two of just sixteen teams left undefeated in NCAA Division 1, and nationally ranked Buffalo ensured they remained in that group in front of 5,000 fans. Neither team was able to gain and edge, and as USF made a late rally, making it a one possession game heading into the final six minutes, Montell McRae knocked down a pair of huge three pointers, before CJ Massinburg sealed the outcome at the line, going 5-of-6 down the stretch. Senior Nick Perkins most named the tournament’s Most Valuable Player as he had 22 points, five rebounds, an assist and two blocks in the victory. Harris was also named to the All-Tournament team with 15 points and eight rebounds. “It was a great win for us against a quality team. San Francisco is probably the second-best team in a really good league in the West Coast Conference, so for us to be able to get them on neutral floor like that and get a good quality win is huge for our programme. “This crowd is by far the best crowd in an EMT we’ve been in. Getting all the [primary school] kids in on a Friday when the adults are in work is an unbelievable idea, I thought it was awesome. Even better that we got to visit the schools and then they were at the games. San Francisco were led by 19 points from Frankie Ferrari and 17 from Matt McCarthy. Stephen F Austin turned in what they believe to be their finest defensive performance of the season, in a 66-51 triumph over the Panthers to place third in the Goliath Bracket. What. An. Experience. We can’t say enough about the hospitality and big time tournament the great people of Belfast, Northern Ireland displayed this week. Kevon Harris turned in a 15-point, 10-rebound double-double to lead the way for the ‘Jacks who posted the program’s first victory on international soil. Shannon Bogues netted 11 and freshman guard came off the bench to knock down four second-half three-pointers to help lift SFA to its 1,500th victory in program history. Stephen F. Austin used a decisive scoring run that spanned both halves to pull away for good. Jake Wright, Carson Warren-Newsome and Wil Sessoms each contributed a team-high nine point for Milwaukee. Marc Mulholland, Executive Director of the Basketball Hall of Fame Belfast Classic added, “I am delighted that this year’s Basketball Hall of Fame Belfast Classic was such a huge success once again! “It was with immense pride that we were able to double the size of the Belfast Classic for 2018 and bring the tournament back to Northern Ireland for its second year. 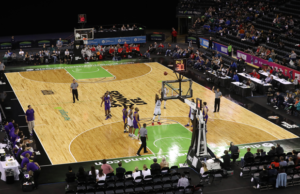 As expected, the basketball was of the highest level and was thoroughly enjoyed by all of those from across the world who travelled to Belfast to watch it live.